Grover Covington’s CFL career began in 1981 when a pre-season trade with the Montreal Alouettes brought him to Hamilton where he played from 1981 to 1991. Throughout his 11-year career, Covington always gave back to the community at every chance he could. In 1985, Covington was the first winner of the Charlotte Simmons humanitarian award which was the Tiger-Cat who contributed the most to the community. Covington devoted his life in Hamilton to football and the community. Among Covington’s many career highlights as defensive end was being named the CFL sack leader in 1988 with 25. 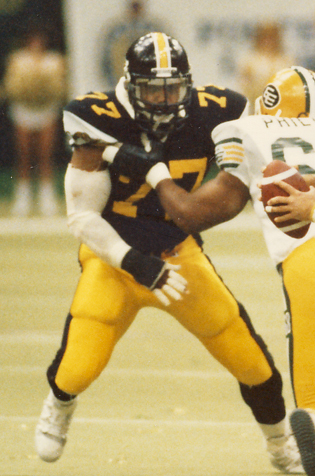 At the time of his retirement, Covington he was the CFL’s all-time quarterback sack leader with 157 sacks to his credit.